Disney’s The Lion King 3D is going to be hitting 3D movie theaters on September 16th for two weeks, but the release will be available in limited number of 3D cinemas. So if you are unable to watch the new 3D version of the popular animation, you will be able to get in on Blu-ray 3D starting October 4th. The original Lion King was released in 1994 and instantly became big hit, making it one of Disney’s most popular animations and probably the one bringing in some of the highest profits, so it is no wonder that the company has decided to revive the movie in 3D. As you can guess it is a conversion from the original movie into a 3D one, so it is essentially a 2D to 3D conversion like most new movies we see in 3D nowadays. But unlike new movies that can be shot now in 3D instead of 2D and then converted to 3D, with a older classic movie you are only able to convert it to 3D if you want to bring it “back to life”… or do a remake in 3D, but that will be a process requiring a lot more time and resources. 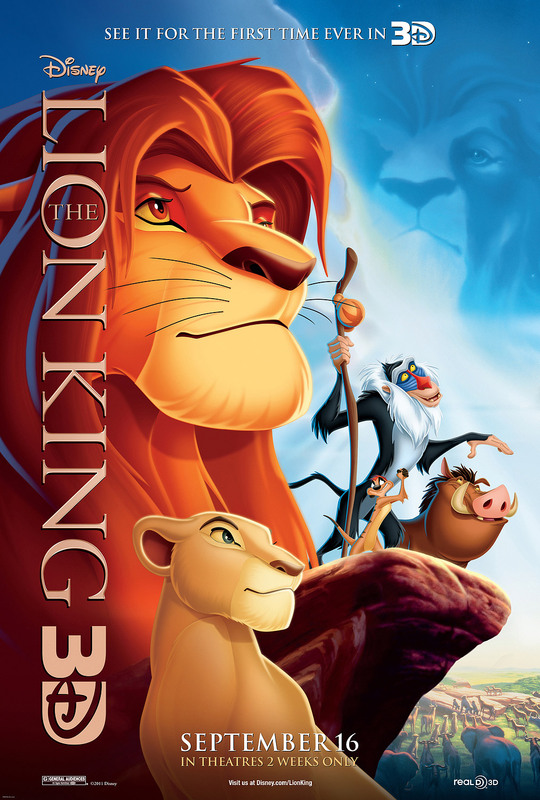 You can say that Disney is checking the interest of the audience to see if people are going to be willing to watch an older classic animated movie on the big screen in 3D, so if The Lion King 3D turns out to be a success they may as well bring more of their popular classic animations converted into 3D. And this movie has all the chances to do it, if the conversion is really well done and the result is as convincing as if the movie was originally intended to be made in 3D format. And we have all the chances to get exactly that considering that the conversion was led by Robert Neuman as a stereographer who already has experience with making quite a few stereoscopic 3D animated movies. According to the information available the conversion of The Lion King took about 4 months to complete by a team of over 60 people, so we should be getting a high-quality 3D conversion. Due to the fact that the movie is a hand-drawn type of animation and not computer generated 3D animation, as most recent 3D movies are made, I’m expecting that the conversion to 3D will not be that perfect. Even just considering the fact the movie has not been planned for a 3D version when was originally made and that makes some scenes harder for planning an realizing the level of depth, so that there won’t be any objects violating the stereoscopic window for example (cut by the sides or the top of the frame while at the same time they produce the feeling of jumping out of the screen). Hopefully there will be just minor issues with that of smaller objects, so that they won’t be bothersome for the audience, as you cannot just go for adding depth to the movie, you also need some things to pop-out at times for the best user experience. Of course when having an animated movie you don’t need to add 3D to make it more realistic, after all animations do rely on stylization of the characters and scenes in order to better convey the desired emotions. Don’t forget that animations are mostly intended for younger audience and thus the extra stereoscopic 3D features in the movie should have the main goal of putting the viewer deeper into the story displayed on the screen and helping better translate the ideas of the authors of the movie. Hopefully this was done well enough in The Lion King 3D, so that instead of being WOWed by the 3D effects in the movie you will kind of forget all about the movie being a 3D one, as all your attention would be focused on the world of Simba and the adventure that lies in front of him. Unfortunately The Lion King 3D movie won’t be hitting the movie theaters nowhere near where I live, so I’ll be waiting for the Blu-ray 3D version to become available in order to get it and watch the movie. You can actually get the Lion King 3D blu ray now from Amazon France and forget all this waiting nonsense. “you also need some things to pop-out at times for the best user experience” – nope. Since pop-out is the one thing that messes with our vision the most (due to eyes converging and focusing on two separate distances simultaneously), it’s rapidly disappearing from use. Good riddance, I say. As for The Lion King, I’m not expecting much 3D-wise since the source is pretty much the worst possible: strictly 2D planes laid on top of each other. Separating the layers might bring depth but it would look like cardboard cutouts. To create roundness Disney has probably been forced to create 3D models, around which 2D images and textures are “wrapped”. I think the same method was used for The Nightmare Before Christmas. has 3d in movie theaters gotten better/ cheaper since Avatar in 3D? or is nvidia 3d vision still significantly better? I saw last year Beauty and the Beast in 3D in a theater and it was really amazing. It may be traditional animation, but at its time it was heavily computer-aided. I was surprised at how everything has volume, which is something unexpected from a 3D conversion. For me Lion King is a lesser movie, but I hope they remale Aladdin in 3D, that would be great! Viewed the first 15 minutes of TLK. It looked better than I expected, although one couldn’t shake the feeling of cardboard cutouts. I also saw at least one instance of a close-up where parts of the face were at incorrect depth levels. There was also a peculiar horizontal motion anomaly in some shots, but I can’t say for certain if it was on disc or caused by the 3D projector until studying it closer. I saw 20 min of Beauty and the Beast 3D last year at D23 and have now seen Lion King 3D twice, once at D23 and at the world premiere…they are both amazing! To start, they were great movies to begin with. The stereography has been done in a fashion as to enhance the story. After initally being “wowed” you forget that you are watching in 3D, you just get engrossed in the environment of the action. Beautiful! I work at a conversion company about a year and a half ago we did some successful stereoscopic tests on a different Disney classic before this one was begun. (I didn’t work on TLK though.) 2D animation can look utterly fantastic in 3D, so I was crazy excited to see it. There were some problems with the depth, but overall it is pretty good, and there are far fewer of the typical conversion issues/mistakes that have turned audiences off to converted films. Most of the wide shots in TLK3D were gorgeous, but there are consistent depth issues the closer the shots were framed, especially the closeups of the lions. If you have a good eye for depth it’s pretty distracting to see whiskers and eyes ‘floating’ or facial features popping too far forward/back. On many shots you could see the outlines of rotos slipping, edges dropping back, mouths/teeth not playing at correct depth, contact points where characters touch each other not at the same depth, etc. But for 95% of viewers, the fact that Mufasa’s nose is closer to them than his ears is all they will notice and that’s enough for them volume-wise. So the conversion is pretty successful, and the box-office numbers and reviews seem to support that. And 3D does a lot for this movie, especially the environments. I found myself noticing and appreciating just how beautifully rendered the original backgrounds were artistically, and how lovely they now looked in 3D. If the original art wasn’t done convincingly, it’ll look crap when projected onto a 3D object, so it really speaks volumes (ha) for the original BG artists that the environments in this movie look so beautiful when rendered in depth. TLK was a good choice for conversion. There are still kinks in converted films but with TLK there’s been a lot of progress toward a much more smooth, pleasing, and realistic result. I do feel that the depth could have been better though. Other Disney projects have been held to unreal quality standards on their converted scenes. A good portion of Tim Burton’s Alice was converted. A couple handfuls of shots in Pirates 4 were converted–and you don’t know this because they had to blend in with the ‘native’ footage perfectly. And they did. TLK needed a finer-toothed comb on its depth to get it right. It’s almost there. Is seeing it in 3D still pretty much the raddest thing ever? Oh heck yeah.